Built to PowerTower’s unique standards of reliability, versatility and simplicity, our vertical mast offers the maximum light dispersion with one of the tallest masts in the industry. A hydraulic lift with pendant control, indexed adjustment pins, and smooth operation provide operators with quick, convenient and safe deployment and transport. A simple and robust design mean long-lasting reliability and simplicity of maintenance. A true PowerTower! 29 Foot (8839 mm), six-section, galvanized, vertical telescoping mast. Hydraulic lift with pendant control. Fingertip, index pin adjustment for lamp positioning. Extended position locking first section. 1/4” AC cable with adjustment studs. Powder-coated light bar with integral lamp plugs. Safe in winds up to 80 km/h (50 mph). 4 × 1000W metal halide lamp fixtures (standard) or 4x 400W LED lamps (optional) with lens guards. 216,000 lumens (54,000 lumens x 4). Secondary fixture retention system (optional). For more information on this mast and other PowerTower products, please give us a call. The Safety Association for Canada’s Upstream Oil and Gas Industry’s guidelines to help you understand lighting requirements. The versatility of our PowerTower light towers is where we really shine. 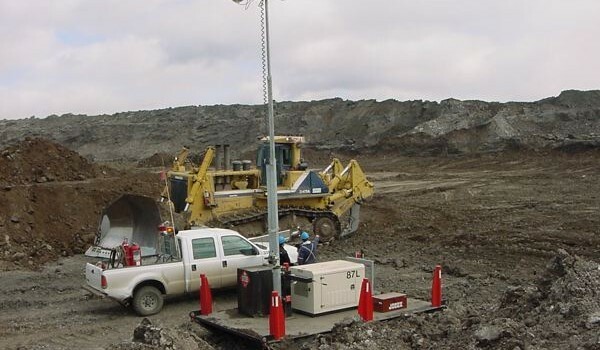 These light towers are built to withstand Western Canada’s severe operating conditions. The trailer mounted PowerTower offers portable light and electrical power with options to tailor the unit to your requirements. Solid based, portable, productive, and job site ready with light and electrical power. Heavy-duty skid with bollards to protect the light tower. Forklift pockets help with moving the unit around the job site. Ready to go light and power package. Add one to your multipurpose unit or use as replacement for existing genset units. Custom features and colors available to match fleet colors. The Genesis Power Lights towers provide durability with simplicity of operation and maintenance. When it comes to industrial lighting, we have you covered with standard light masts or masts built to suit your application large or small.